It’s from my neighbor, Marie, that I first heard about gardening with native plants. That was more than 20 years ago. Marie, and her late husband, Bud, carried a pail and gardening shovel in the trunk of their car. When they encountered a plot of land that was being developed, they leaped into action, digging up and rescuing the native plants they discovered on the site. You’ll notice that I’m not mentioning Marie’s and Bud’s last name as their activity may be interpreted as trespassing, but their intent was to save plants that grow—and thrive—in our climate and conditions; plants that send deep roots into the soil and provide nectar and seeds that support our local bees, butterflies, and birds. Two other generous neighbors—Erlinda and Bob—have also kindly shared plants with me. I’ve learned to appreciate the beauty of the plants, and admire their diversity and determination. And because I now grow many native plants, I’m able to notice and print the fleeting blossoms and leaves of the spring ephemerals at this time of year. By looking up information online or in books such as Stan Tekiela’s Wildflowers of Minnesota Field Guide, I’ve learned more about native plant families, habitats, and their Latin names that I now place on the back of the note cards I reproduce from the original prints of the plants. In addition to the generosity of neighbors, the best sources with which I’m familiar for purchasing native plants are local native plant nurseries. 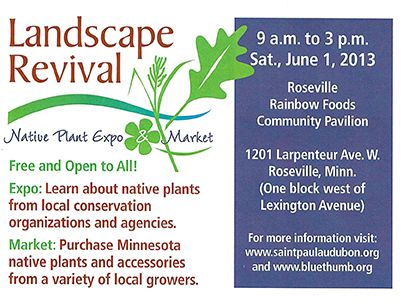 Twelve of them will convene this Saturday, June 1, 2013, at the Landscape Revival, a market and expo that is sponsored by local conservation groups and agencies. I’m looking forward to participating in this event by demonstrating nature printing and having note cards and prints available to purchase. I hope to see you there. Read more in Kim Palmer’s informative article, “Building Buzz,” in today’s StarTribune.